The STEM Expression Language is designed to allow easy access to key components of the STEM modeling and simulation framework by using variable and function-driven equations. The variables and functions are designed to simplify access to STEM APIs for getting compartment values, model parameter values, as well as access to various denominator data through functions. Currently the expression language is primarily built around simple arithmetic operators, such as +, -, *, and / using infix notation. Parentheses ( and ) perform subexpression grouping and enforce operator precedence. The equals operator = is used for assignment when defining local variables. The delta keyword defines the final statement in an expression. This represents the "return value" for the expression. There are four types of user variables that are visible to your expressions, three of which a user can change. Global Variables that represent key parts of the simulation state. These are fixed and cannot be edited. A fifth type of variable are system variables. These variables are not visible to the expression language and are only used by STEM API developers. Global variables are system-defined variables that are helpful as input to determine rates relative to time. timeDelta - The time step (in ms) used in the simulation. t*timeDelta is the total (simulated) time (in ms) since the start of the simulation. Model parameters provide access to the rate parameters defined in your disease model - and changeable by editing the value in your disease or as part of an experiment/automatic experiment. Model parameters are generally numeric (double) values and visible by their name as defined in the model. Relative compartment values are calculated as Compartment Value divided by Region Population Count. They are accessible to expressions using the compartment name beginning with a lower case letter. Absolute compartment values are the absolute number of population members in a given compartment for a node at the current time step. They are accessible to expressions using the compartment name beginning with an upper case letter. Expression statements are "local" variables. A user may define statements above the "delta" line that then can be used in subsequent statements in the expression. Functions are special procedures/operations that provide access sophisticated data access and manipulation features in STEM. Functions accept zero or more parameters as inputs and return a single output, generally a floating point number. Some functions may not accept user inputs but are still context-sensitive based on the current region and time step, for example the Earth Science functions. 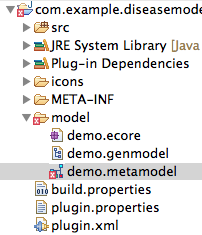 In addition to the built-in functions listed below, many operations in the Java Math API are also available as STEM functions. A "comment" - text that is not considered or evaluated as part of the expression - can be entered by prefixing a line with // . This creates a comment for the rest of the line. The Visual Editor's Expression Editor is a simple tool to enter the equations that describe the movement of a population between two compartments for each region for each step of the simulation. The transition value - the delta - as calculated by the equation entered represents a balanced decrease from the source compartment equal to the increase in the target compartment. 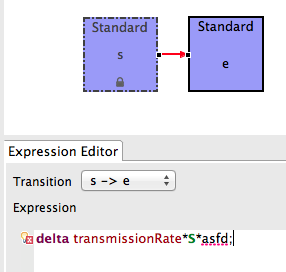 The last statement in the expression editor must start with the delta keyword/operator. This is the value used to compute the movement from source to target compartments. The content assist feature provides contextual suggestions to assist a user authoring expressions. This includes partial-completion of variables, functions, and operators. In the future, complete documentation will also be available from the content assist window. Content assist is available at all times while editing an expression. To access the content assist prompt, simply type Control-<Space>. You can continue typing to further filter available syntax/semantic options. For internal and reporting purposes, the STEM simulation engine needs to know which transitions represent an increase in disease incidence. The (positive) delta value of the transition will be added to each incidence total after each step. A transition can account to zero or more incidences that are included in a disease. 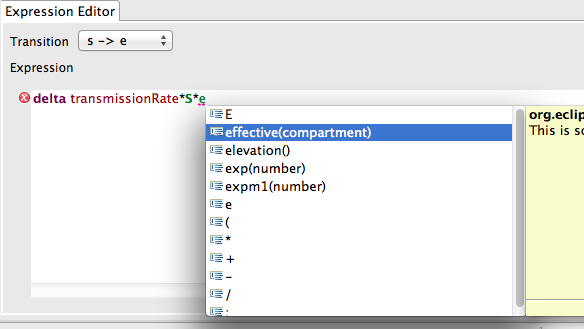 Under For Incidence, check the box(es) next to the incidence name for a given transition. Any problems with the syntax (structure) or semantic (types, etc) of your expression will result in an error. Important note: Errors in the model will prevent the expression compiler from generating the code to update your disease/population model. Please fix any errors before trying to run the model in STEM.